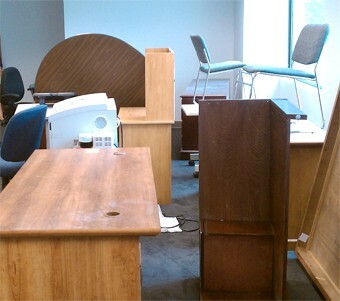 Desks, chairs, tables, beds and more, 1-855-F'IN-JUNK is the easy way to get rid of old unwanted furniture. Need some old furniture hauled away? If you're like most people, you're probably not looking forward to loading that old furniture into a truck and driving to the dump. But there's good news: you don't have to! 1-855-F'IN-JUNK picks up old, broken, and unwanted furniture right at your door. We'll come in and do all the lifting, just show our team of junk removal professionals where the junk furniture is at. 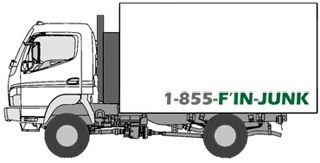 Check out our low minimum rate and do the math - when you add up the time, gas, and disposal fees of hauling old furniture yourself, calling 1-855-F'IN-JUNK makes a lot of sense. How much does it cost to have furniture hauled away? Junk removal prices are determined by volume. If you know the approximate size of your unwanted furniture items, you can get a rough estimate by checking our junk removal price chart. How do I schedule furniture removal? Scheduling a furniture pickup is easy, and only takes minutes!